WOW! Has it really been three weeks?! When we decided to come to Kemah to get our auto pilot repaired (or replaced) we had no idea how long it would take. 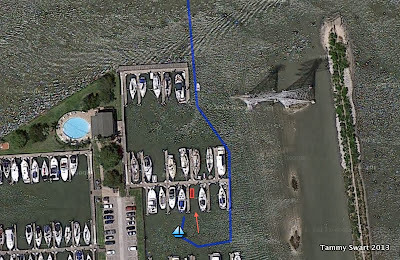 We had input from so many of our Facebook friends to help us find a good place to stay (and True North Marine to fix our autopilot) while we worked things out. We could NOT be more happy with the spot we finally chose… Portofino Harbour Marina. There were several spots to choose from, both in Kemah, as well as on the “Other Side Of The Bridge” in Clear Lake Shores. While Portofino may not look like much from the outside, we’re glad we picked this spot. It turns out that the Staff and Grounds could not be more pleasant! The facilities here are always clean and the grounds are kept meticulously. The maintenance people were friendly and helpful (Frank even helped Bruce cut the rusted chain off our ground tackle). There is a very nice ClubHouse with a kitchen and big screen TV that we were free to use. We enjoyed the top deck for watching the sailboats come and go. The Marina is gated and the slips are “owned” with some for use as transient slips, kind of like Condo ownership so the people here take obvious pride in the Marina. Although our repairs only took about an hour and a half, we had already committed to a month. It was a gamble going in… if we had ended up staying for 5 days, the monthly rate would be more economical. So, we booked a month, thinking we would be here at least a week with the auto pilot, and we had some other things we could knock out while we were here. Now let me point out here, that the “Old Me” would not have been able to make this transition from Plan A to Plan R (way past B on down the plan line) quite as seamlessly as the “New Me” has. In fact, we’ve both embraced the spontaneity of it all! We rolled right from “movin’ on” mode to “this-place-is-nice-lets-stay-here-a-while”… While this may not be very entertaining for our readers out there… it should be noted that it signifies a huge breakthrough for us. It has only taken us a month to break free from the dreaded scourge of Cruisers everywhere… the “PLAN”! 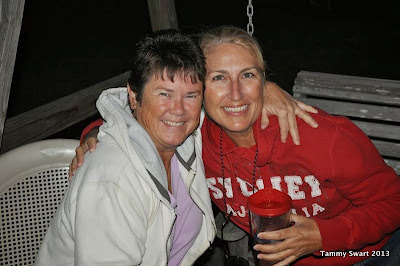 Janet (WWS)and I having happy hour aboard Adventure US 2! These three weeks have been blissful. We met several of our friends from Facebook, moving them from "FB friend" to "friend IRL". (In Real Life). One of our FB friends even came by and dropped off a pair of free Boat Show Tickets! We went over to Seabrook for the show, crossing the lake in the dinghy! It was such fun, THANKS ROBERT! Katie (WWS) hot on our trails aboard Our Way Too! And more WWSs Deana from Storyville, and Tammy from Menestheus! The folks on our dock and around the Marina have also been such a source of information and entertainment! Why would we leave such a friendly bunch? Bruce and I have attended Happy Hours and we’ve gone to dinner with friends at several really great restaurants. We even went to Outriggers $2 Taco night by dinghy! TWICE! We have met several women and their mates who are a part of a dynamic and talented group of women on Facebook called Women Who Sail. If you aren't a member and you have an interest in the sailing life, look them up! You'll be SO glad you did! One of the best surprises we've had was an invitation to a local Rum Distillery. We got the tour and bought some yummy Spiced Rum! The sunrises and sunsets have been beautiful and every day I have been filled with such a feeling of gratitude that I have the opportunity to be right here… right now… doing just this. We have laughed more, strolled hand in hand, and talked about how lucky we are to be Cruising while forgetting about the problems of the world. We’ve ridden our bicycles around town, we bought delicious fresh veggies at a local Farmer’s Market, we found Treasures at the Boater’s Resale Shop… even doing our laundry, while sitting by the pool with my Kindle as the machines did the work, was such a pleasure. 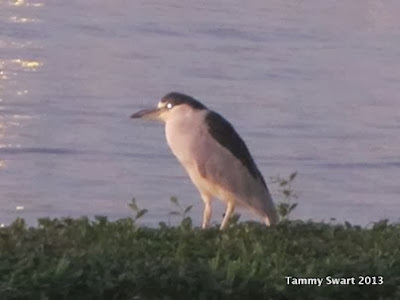 We have taken pleasure in the simple things like watching the Black Crowned Night Heron try to find fish in the pool, or listening to the multitudes of Cormorants squabbling over the choice spot to roost for the night high up on the power tower near our slip. It’s been fun sitting by the channel poolside, watching the little ducks effortlessly taking the fast lane by way of the ripping outgoing tide. Our time here has not been all play… not by a long shot! Cruising is divided into two parts… Time at the dock, and time away from the dock. Well, the time at the dock is packed with chores! There is unlimited water and power and access to supplies and parts… None of these are available while traveling or at anchor, so the most must be made of Dock Time. When we arrived, we sat down and made a “To-Do” list of the things we would like to get to while we were here. We are happy to say that we’ve been able to knock all of them off that list! First on the list by “odor" of importance, were unclogging the forward head and replacing the permeated (read stinky) waste pump out hose. I won’t go into the gory details, but those were the first two jobs we tackled and they took three days and involved much physical gyration. Hose clamps near the point of failure!!!! But the big projects that we were happy to see behind us… were improvements to our ground tackle. First, we made a new anchor snubber. Then we turned to our anchors. We have three, a 55 lb. Spade, a 35 lb. CQR and a Fortress as our third. They all came with the boat and we considered buying one of the newer anchors… but decided that since our boat has been successfully cruised for years with what we have aboard, we would try these out before we go spending a bunch of money for an unknown. All of this activity has been very physically demanding for me. Remember… I have spent the past 20 years sitting at a desk. Now I’ve been plunged into days of constant activity, which is FUN… but has left me with sore muscles to the MAX! I love the fact that even going to the bathroom takes a certain amount of physical activity in just pumping the handle or climbing off the boat and walking to the shoreside facility. Going to the grocery store involves a bike ride and packing stuff home in a back pack. Cleaning the deck looked like an audition for a game of Twister! I have enjoyed becoming more physically flexible and can feel steady improvement in my overall condition. And it’s meaningful, not just working out mindlessly on a treadmill. So… on the eve of our departure from this place, I can find so many things to remember fondly. It’s difficult to go (that Dock Glue again?) but we are eager and excited to get on to the next new adventure. We have been studying the charts and available sources of information and have made some plans. Next stop, somewhere in Louisiana and maybe a new chapter for future reflection. I so enjoy reading your blog! It's cold here in Michigan and I started work at 6:00 this morning. I have eight more years to work and I love reading about your retirement. I don't care if you are sitting still working on the boat; or cruising. It all sounds great. On another note. We are working on our boat too. Even though it is up on blocks, covered and lonely; the work still goes on. Our winter projects include replacing the all of the hose for our heads too. Hubby ordered 50 feet of hose and picked it up last week. We have two heads and we were noticing a smell that we couldn't get rid of. 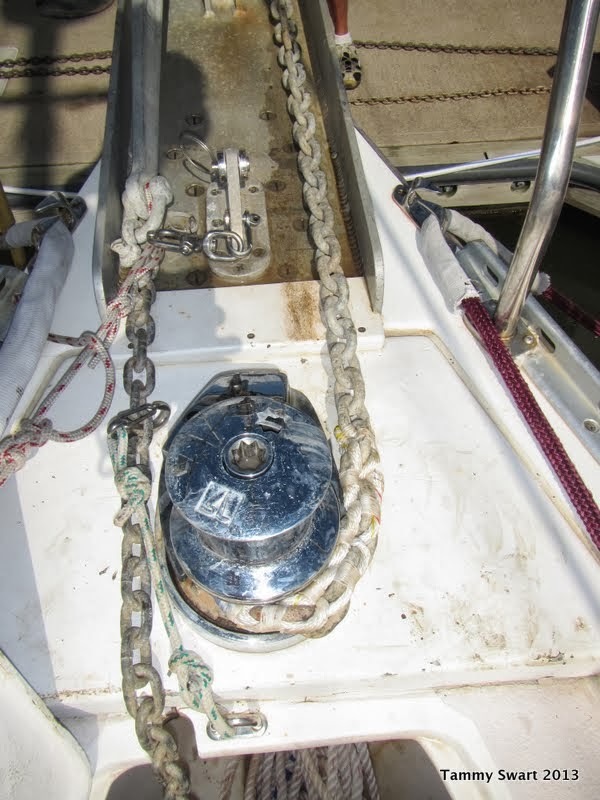 Talking to a few other boaters we learned about the permeation of the existing hose problem. Yuck. Yesterday he cleaned all of our deck carpeting and put it out on the patio to dry. Saturday he taped the door on our shrinkwrap, put out the moisture control tubs and brought home any boat repair supplies that would freeze. I had already emptied the galley and heads of that kind of thing. I brought home all of the summer clothes too because we are going to Florida on vacation this winter! YAY! Our plan is to be there in the time frame to take in the Miami boat show. Any way have lots of fun! Enjoy! Marie, thanks for your kind words. Eight years... I remember when it was that long for us. The time really does fly. It sounds like you've got your entertainment planned with all of those boat projects. It's amazing how much these babies need. I think we are going to have to buy a couple of new batteries in the next week or two... it's always something. I can NOT imagine having a boat in the cold place you live. If it's below 70, it's WINTER! If you have a blog, please post it so that I can see how you're doing along the way too. Thanks for hanging out and being there. Hi Tammy, I started a blog when we took our first trip with our boat. I wanted to keep it up; but life just got in the way. I have thought more and more lately about trying to post on an irregular basis. The past few years my job has been 50 plus hours a week and there just doesn't seem to be time. With all of the projects we have planned I've truly thought I should make the effort. I so much appreciate those that do. I've learned so much from so many wonderful boat bloggers. Thanks Marie! I've added your blog to my list so when you do post I can read about it... when we have wi-fi. I just can't imagine living with the cold! NO WAY! We are about to buy a couple of batteries... one of ours has died and it's pulling another one down. We have four and one already new. It's only money. Yes, boats are a lot of work... amazingly so. Keep hanging out, we can all learn from one another... cut down on the newbie mistakes maybe. Glad to have you along! Where In The World Is Baffle Point!!! ?